...that there are now some 33 vaccines mandated by the time your child is 6 years old? And 40 by age 16? ...that more are on the way? ...that U.S. children are the most vaccinated group not only in the world, but in all of history? ...that vaccines are not tested before they are put on the market? ...that most infectious diseases had already declined 90% by the time vaccines became mandated? 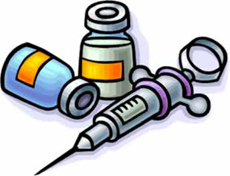 ...that only one country in Europe still has mandatory DPT vaccination, whereas the U.S. requires four separate shots? ...that Hepatitis B vaccine was halted in France after 15,000 citizens filed a class action suit against the government? ...that in Oct 2000, the American Academy of Physicians and Surgeons called for an immediate moratorium on all Hepatitis B vaccinations because of all the negative side effects to thousands of children? ...that "mandated" doesn’t mean "mandatory", and that there is a simple exemption form in most states, which when signed by a parent exempts the child for life? ...that all 696,000 Gulf War personnel were inoculated with three completely untested vaccines, resulting in 80,000 of them contracting a permanent disease known as Gulf War Syndrome? ...that many pediatricians will not inoculate their own children? ...that vaccines are a multibillion dollar business in the U.S.? ...that mercury in most vaccines is dozens of times in excess of EPA safety levels? ...that vaccination is not immunization? In the December 1994 Medical Post, Canadian author of the best-seller Medical Mafia, Guylaine Lanctot, M.D. stated, "The medical authorities keep lying. Vaccination has been a disaster on the immune system. It actually causes a lot of illnesses. We are actually changing our genetic code through vaccination...100 years from now we will know that the biggest crime against humanity was vaccines." After an extensive study of the medical literature on vaccination, Dr. Viera Scheibner concluded that "there is no evidence whatsoever of the ability of vaccines to prevent any diseases. To the contrary, there is a great wealth of evidence that they cause serious side effects." These would seem to be radical positions, but they are not unfounded. The continued denial of the evidence against vaccines only perpetuates the "Myths" and their negative consequences on our children and society. Aggressive and comprehensive scientific investigation is clearly warranted, yet immunization programs continue to expand in the absence of such research. Manufacturer profits are guaranteed, while accountability for the negative effects is conspicuously absent. This is especially sad given the readily available safe and effective alternatives. "I'm currently litigating against the four companies that make all 72 vaccines currently mandated for American children via CDC recommendations. All four of these companies are convicted felons who have paid $35 billion since 2009 for lying to and defrauding regulators and doctors in order to promote their pharmaceutical products. Our trial team coalition includes the country's largest plaintiffs firms  all of them veterans of the Monsanto litigation. These firms have won the largest pharmaceutical cases in history. It's not surprising that we have uncovered proof that the four vaccine makers' fraudulent and reckless conduct with their other pharmaceutical products pales in comparison to their crimes in testing, manufacturing, and marketing vaccines, since, in this arena alone, they are immune from liability. We can now show with scientific certainty that certain vaccines, such as DTap, DTP, and Hep B, are killing and injuring far more children than were ever harmed by the diseases they are marketed to prevent. This information will soon be public." Read about a study done by parents!
" Private Study Links Vaccinations to Neurological Disorders"
Book review: (a must-read for all parents) "VACCINATION IS NOT IMMUNIZATION"